The most interconnected generation in history is navigating unimaginable amounts of social pressure, both in personal and online interactions. Very little time, focus, or education is being spent teaching and coaching this generation how to navigate this unprecedented amount of "stuff" entering their lives each day. How do we help the overloaded and distracted next generation deal with increasing complexity and help them not only survive, but thrive? How do we help them experience stress-free productivity and gain momentum and confidence? How do we help them achieve autonomy, so that they can confidently take on whatever comes their way? An adaptation of the business classic "Getting Things Done" for teenage readers. The most interconnected generation in history is navigating unimaginable amounts of social pressure, both in personal and online interactions. Very little time, focus, or education is being spent teaching and coaching this generation how to navigate this unprecedented amount of "stuff" entering their lives each day. How do we help the overloaded and distracted next generation deal with increasing complexity and help them not only survive, but thrive? How do we help them experience stress-free productivity and gain momentum and confidence? How do we help them achieve autonomy, so that they can confidently take on whatever comes their way? "Getting Things Done for Teens" will train the next generation to overcome these obstacles and flourish by coaching them to use the internationally renowned "Getting Things Done" methodology. In its two editions, David Allen's classic has been translated into dozens of languages and sold over a million copies, establishing itself as one of the most influential business books of its era, and the ultimate book on personal organization. "Getting Things Done for Teens" will adapt its lessons by offering a fresh take on the GTD methodology, framing life as a game to play and GTD as the game pieces and strategies to play your most effective game. It presents GTD in a highly visual way and frames the methodology as not only as a system for being productive in school, but as a set of tools for everyday life. 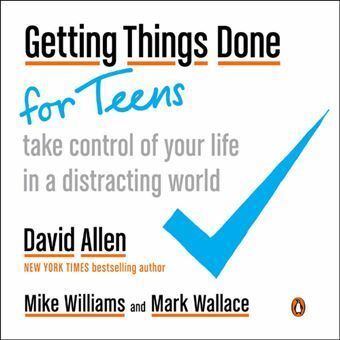 "Getting Things Done for Teens" is the how-to manual for the next generation--a strategic guidebook for creating the conditions for a fruitful and effective future.